Easter’s on its way to Northwest Arkansas, mamas! It’s a little later this year on April 21st. 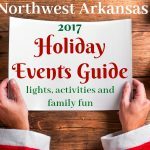 As always, NWA is jam-packed with super fun events for kids and families. Looking for where to get pics with the Easter Bunny? 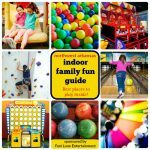 The Northwest Arkansas Mall always has an awesome setup near Dillard’s (the women’s wing) to visit the Easter Bunny and get pictures with him every year! The big bunny will be hippity-hopping to the Mall on April 6 and will be there to visit with the kids through April 20th. 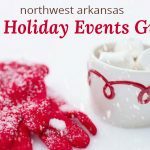 Hours: Monday-Saturday, 11 a.m. to 8 p.m. (breaks at 2-2:45 & 5:30-6:15) and Sunday, noon to 6 p.m. (with a break from 3-3:34 p.m.) Our thanks to the NWA Mall for sponsoring this big list of Easter events and activities! →Easter Color Blast. Saturday, April 13, Rolling Hills Baptist Church, Fayetteville. 3-5 p.m. Give your kids room to create and play with movement, color, and energy. 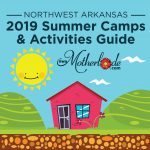 Come experience a fun-filled afternoon with explosive games, a color-powder dance party, and time to make their own art with snacks at the after-party. Don’t forget to dress you and your kids in a white shirt with clothes and shoes that you wouldn’t mind becoming a lot more colorful. If possible, please bring safety glasses for you and your children, but some inexpensive pairs will be available for purchase at the event. →Highlands Church Easter Egg Hunt, Saturday, April 13, 11 a.m. Bella Vista. Family friendly Easter Egg Hunt at Highlands Church. Free and open to the community. 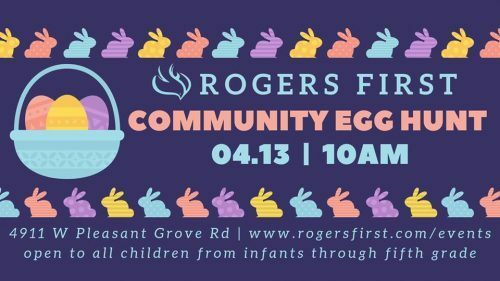 →Rogers First Church of the Nazarene Community Egg Hunt, Saturday, April 13, Rogers First Church of the Nazarene. 10-11 a.m. There will be lots of candy and tons of fun. For a chance to win a prize basket, please register online at www.rogersfirst.com/events! →Aqua Egg Hunt. For Bentonville Community Center members only. April 13, 8:30-9:30 a.m. A new way to enjoy the classic Easter egg hunt- in the water. 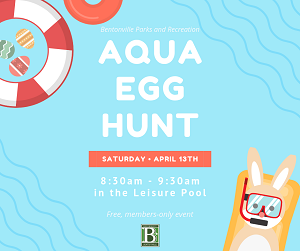 Egg hunters and their families will enjoy an egg hunt in the leisure pool at the Bentonville Community Center and then stay and play in the water until the end of the time session. 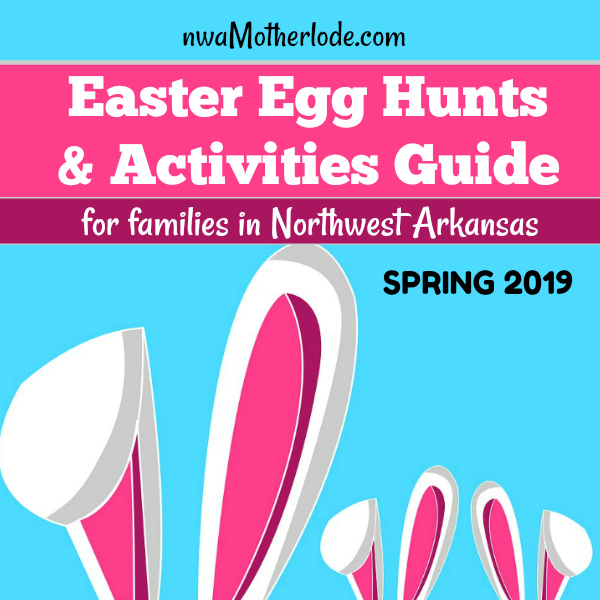 This event is limited to 60 egg hunters (12 years and younger) and their families. Mesh egg bags will be provided for each egg hunter! 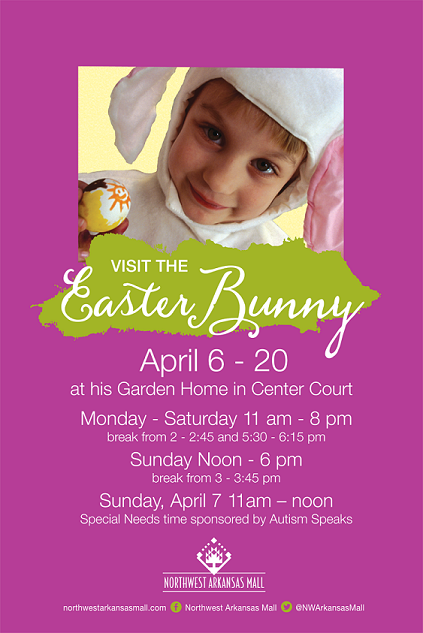 →The Special Egg Event, Hope Church NWA, Bentonville. Saturday, April 13, 3-5 p.m. This is a free Easter Egg Hunt for children with special needs and their families. Registration is encouraged by March 30th to ensure a t-shirt for your child. 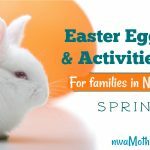 Egg hunts that are designed for 4 categories of special needs children (quiet, talking, magnetic and general) and their siblings. Special Kids Events is a ministry of Canvas Church and Hope Church. →The Great Egg Hunt, Happy Hollow Elementary, hosted by Hyland Park Assembly of God. Saturday, April 13, 11 a.m. to 1 p.m. Candy, fire trucks, giveaways, egg hunt, a free goodie bag to the first 100 kids, and more. →Easter Eggstravaganza at Gulley Park. Easter Eggstravaganza, Sunday, April 14, 11:40 a.m. to 2 p.m. Fayetteville First Church of the Nazarene invites you to a FREE annual community egg hunt at Gulley Park. Ages 0-6th grade. Registration begins at 11:45 and the egg hunt begins at 12:30. There will be games and activities for the whole family, face painting, door prizes, and a free hotdog lunch served. Visit www.faynaz.org or email children@faynaz.org for more information. 15,000 EGGS. RAIN OUT DATE: April 17th. Skip the lines by pre-registering. →Easter Egg Paint and Hunt. Sunday, April 14, 2-3:30 p.m. Imagine Studios, Rogers. Kids of all ages are invited to paint ceramic Easter bunnies followed by an Easter egg hunt. Bring your own Easter basket and a grown up too. $20 per child. →Free Family Easter Scavenger Hunt, hosted by Grace Baptist Church in Rogers. Play along from home. Scavenger hunt begins on Monday, April 15th. Daily clues can be found at https://www.facebook.com/gbcchildrensdepartment/ Family groups may include your own kids, grandchildren, friends, etc. Get the clue, solve the task, take a selfie (as a keepsake). Optional: Text your daily selfies for a chance to win a giant filled Easter basket. Drawing will be held at 11 a.m. on April 21. You do not have to be present to win. →Easter Egg Hunt, Saturday, April 20, Hickory Baptist Church, Lowell. Noon to 2 p.m.
→Springdale Parks & Recreation Easter Egg Hunt, Saturday, April 20, 10 a.m. to noon, C.L. “Charlie” and Willie George Park. 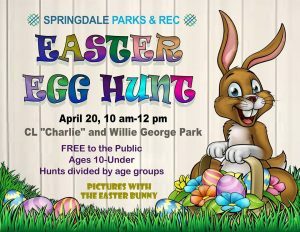 Join Springdale Parks and Recreation for a FREE community Easter Egg Hunt for ages 10 and under. Located on the park football field. Egg hunts divided by age groups. Pictures with the Easter Bunny following the hunt. →Wonderfully Made Easter Egg Hunt, Saturday, April 20, 3-5 p.m., Miracle League Baseball Field, Springdale. Community Egg Hunt open to children of all ages and abilities and their families. Join this event for a quiet, magnetic, beeping, and general egg hunts, Crystal’s Face Painting, guest appearances from Batman, Wonder Woman, Elsa and Anna. Hot dogs and chips are available. The police and fire departments will be there as well. This is a free family event. Please register for the event at firstchurchspringdale.org. →Community Easter Egg Hunt, Central United Methodist Rogers, Saturday, April 20, 2-4 p.m. Join CUMC Rogers to celebrate the birth of Jesus with the Road to Resurrection and a fun Easter egg hunt. The egg hunt and Road to Resurrection will take place on the north part of the church property by the yellow bus barn. The egg hunt will begin promptly at 2 p.m.
→Easter at the Rogers Activity Center, Saturday, April 20, RAC, 10 a.m. to 2 p.m. Bring the family out for a free morning of fun. Free concessions, games, giveaways, photo booth, crafts and the Easter Bunny. →Yvonne Richardson Community Center Annual Easter Egg Hunt. Saturday, April 20, YRCC, Fayetteville. 11 a.m. to 1 p.m. Food, fellowship, fun, thousands of eggs and prizes. This event is FREE, but pre-register to help determine numbers for the event. →Bella Vista Easter Egg Hunt. Saturday, April 20, 9:30 a.m. Pictures with the Bunny, free egg and toy hunt for Bella Vista Members and the Golden Egg are all part of the fun. The egg/toy hunt will be broken out into four age groups: 0-3, 4-6, 7-9, and 10-12 years with a staggered start. There will be one special Golden Egg per age group. The child that finds that egg will redeem it for a special prize. →Easter Egg Hunt/Storytime at Barnes & Noble, Rogers. Saturday, April 20, 2 p.m.
→Egg Drop, Saturday, April 20, 10-11:30 a.m. Brand New Church in Farmington. →Easter Egg Hunt at Springfest in Fayetteville, Saturday, April 20, 9 a.m.
→Indoor Balloon Egg Hunt, Sunday, April 21, 10 a.m. to noon. →Easter at Rogers First Church of the Nazarene, Sunday, April 21, 9:30 a.m. 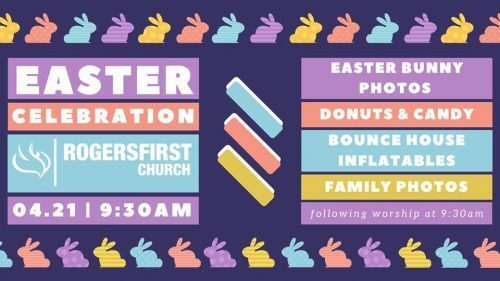 Following a worship service at 9:30 a.m., the Rogers First Church of the Nazarene will have Easter bunny photos, bounce house inflatables, donuts and candy, and family photos. →Breakfast with the Bunny, Tulsa Zoo. Saturday, April 20. Celebrate spring at the Tulsa Zoo. 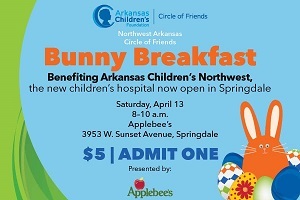 Enjoy breakfast, an up-close animal encounter and meet the Easter Bunny. Participants will have a hopping good time crafting enrichment for some of the zoo’s animals. Registration includes unlimited train and carousel rides, weather permitting. This special event will take place at 9 a.m. AND 12 p.m. on Saturday, April 20, you choose. Tickets are $20 per person for zoo members, and $25 per person for non-members. Children under the age of three years old are $5 each. →Easter Sunrise Service, Eureka Springs. Sunday, April 21, 7-8 a.m. Celebrate the Resurrection of Jesus Christ at the Easter Morning Sunrise Service at The Great Passion Play at 7 a.m. at the foot of the Christ of the Ozarks Memorial Statue. In case of inclement weather, the sunrise service moves inside to the buffet on the grounds of The Great Passion Play. →96th Annual Mt. 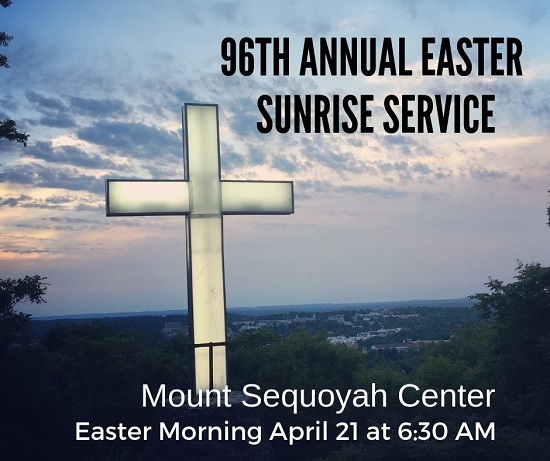 Sequoyah Sunrise Easter Service, Sunday, April 21, 6:30 a.m. The speaker this year is The Rev. Dr. Lora Walsh from St. Paul’s Episcopal in Fayetteville. Weather permitting, worship will be at Vesper Point, outside. In case of rain, everyone will relocate to an indoor location.